Food-driven Retrievers isn’t news to Labrador or Flat-coat owners but will it actually help researchers understand more about human obesity? If there’s a gene that might control “how the brain recognizes hunger and the feeling of being full after eating” why doesn’t it affect Terriers or Working breeds? The University article didn’t go there but TheDogPress.com will. Thanks to Shirley, “the cat lady” we know some cats become obese even though owners try to limit the amount of food. The same can surely be said of some dog owners? Do you have a Flat Coat or Labrador Retriever? Is he perpetually hungry? Would you admit that he’s a little on the pudgy side? Could your dog run in the field all day? If the answers are “Yes”, “Yes” and “No” you need to keep reading. If your dog is of another registered breed or a mixed breed, your answers could be equally helpful. If you’re in Shirley’s circle as a cat owner, you may also recognize this over-eating problem. 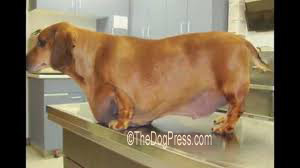 What if you have a toy or terrier breed that is active and fit but YOU are having a weight problem? Read on. The lead researcher told the BBC that only about a “quarter of pet Labradors carry this gene” that urges them to eat more than they need. They called it POMC Gene as though that explains everything. Whatever. The article barely touched on the fact that the most common problem with fat dogs and obese people is that they just don’t get enough exercise to burn off the high-calorie food they ingest. If you are overweight and now, looking at your dog with new eyes, you have to admit he is soft, out-of-condition, and “pudgy” well, this is your opportunity to do something about it. The implication is that dogs whose owners are not wealthy tend to maintain a healthier weight. That is an important factor because human or animal, both species seem to like rich fatty food. In times long past, carnivores depended on both organ meats and fatty foods in perfect balance to fuel the active hunter. So it could be that the researchers who are not “dog people” failed to note that the breed they researched is genetically programmed to require a lot of fuel if in fact, it does the job it was bred to do. 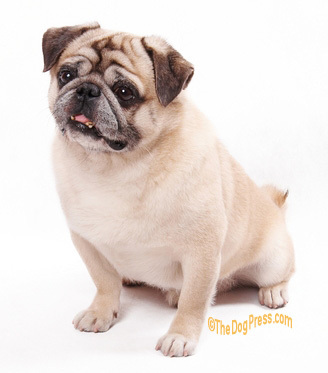 The breed may not have an eating problem so much as a lack of exercise problem. And therein lies the missing piece of what the researchers presented as a genetic puzzle. Labradors and Flat Coats are “hard-wired” to perform in water and in the field, to exert tremendous staying power and burn a lot of calories in the process. Problem is, most Retrievers today are rather sedentary. Significantly, the study mentioned that the variation “was more common in Labradors working as assistance dogs” and noted that they are trained with food rewards. 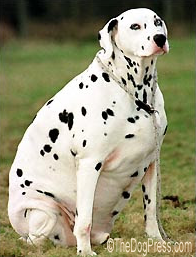 So why wasn’t the “obesity gene” found in other breeds? The takeaway is that while the scientists may have identified an interesting breed-related genetic component, it is of no interest to the majority of dog owners. And to overweight people, it is just a teaser with no answer.